I’ve actually been surprised at how uncomfortable air mattresses can be. It might not be the mattress itself though. I think anytime I have to sleep in a different bed it hurts for the first few days. Different softness hits different muscles? I guess an air mattress doesn’t work as an upgraded version of a flying carpet then? It does. But only as long it’s not punctured. 1. Slowly empty a fully.. hmm… full air-mattress while you’re lying on it completely relaxed. 2. Have someone else (since you’re all relaxed) close the spill once you find yourself most comfortable. 3. Have the best night of sleep of your life. Before I read the caption, I thought this was going to be advice against sleeping on the edge of the Grand Canyon. I don’t understand what is happening in this comic. 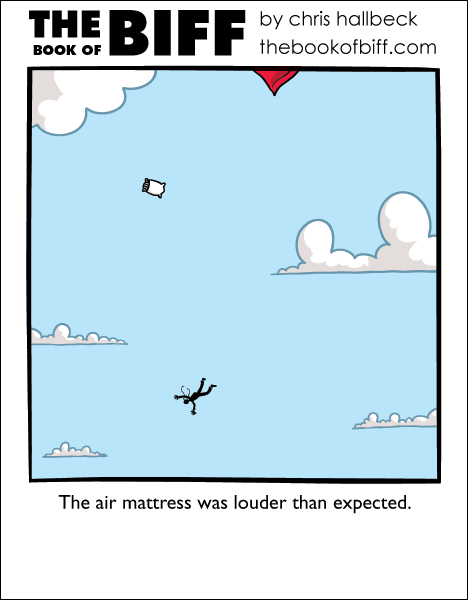 What does the sound of an air mattress have to do with falling from the sky? I’ve been following this comic for years and this is the first time I have just not gotten what is going on. The sound is the roar of the air as you fall through the sky. Ah, Biff tried to sleep on top of the earth’s atmosphere. That kind of “air mattress”. I assumed he had filled it too much and then it popped. Thus throwing him through the air team rocket style.